Delilah and Oliver can finally be together in the real world. But in order to maintain Oliver’s presence, Edgar had to take his place in the fairytale story where Oliver really belongs. As Oliver struggles to acclimate to the new and unfamiliar setting outside his story, he must impersonate Edgar well enough to fool Edgar’s mother and to fit in at school. When another portal between the story and the real world opens, two more characters swap for real life counterparts, leaving Delilah and Oliver to untangle the mess. For both of them, one thing is certain: they must find a happily-ever-after solution for their entire cast. While Off the Page is cute, a few of the plot twists didn’t resonate well with the story, to me. Though Oliver finds a way to exit the fairytale, he’s not a real boy. Punch him, and he’ll bleed ink, not blood. It seemed like at some point this would have to be addressed if he were to intend to spend the rest of his life outside the confines of the book. Also, the swap – a real human boy for a prince in a fairytale – is uneven. A boy gives up an entire life for confinement in a story so that a high school girl can have a life with the boy she’s in love with? What does the story’s new protagonist get out of the exchange? It seems like living in a book would get terrifically old after a while. Other than a few plot wrinkles, the story progresses smoothly, and true love is found by all the essential characters. True to its promise, the tale delivers its happily-ever-after for nearly everyone. Honestly, I really didn’t care for Delilah very much, and Oliver was hit and miss for me. I loved Jules and Edgar (though his name kept tripping me up. I kept thinking of the butler from Disney’s Aristocats. I know, my daughter was recently in a musical performance, so it’s probably just me.) I really wanted the story to be more about them, and I felt like the end sort of cheated each of them. There were some side characters – Socks, Humphrey, and Frump – that really made things entertaining. Over all, I liked the story of Off the Page. It didn’t blow me away, but I wasn’t sorry I read it. Kissing, lying next to each other on a bed. References to fate. There are a couple of passages that compare the living characters in the story Delilah loves to real people – one commenting that we all have an author. Nothing more specific than that. One boy punches another boy in the face. Reference to a dog getting hit by a car. 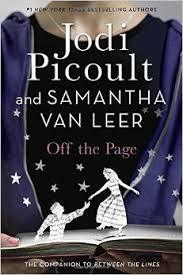 Tagged Children's Literature, Delacorte Press, Jodi Picoult, Off the Page, Samantha van Leer. Bookmark the permalink.